The magic of love is big business. Whether you are looking for love, in love, or just have friends and family you love, Valentine’s Day sparks that inner flame and makes us want to show our adoration with tangible gifts to those who hold (or have the potential to hold) a special place in our hearts. Well, you can head to the big box stores to grab a “cookie-cutter” valentine gift with the mushy card, heart-shaped box of mystery chocolates, and of course, your timeless red roses in a clear flower sleeve or you can get a little more personal… And in my opinion, personal wins every time. Don’t get me wrong, there is nothing horrific about the typical Valentine’s gift. I just believe the simple, sweet, and thoughtful gifts, that take a little more effort, show loved ones how truly special they are to you. Flower arrangements are the perfect way to do just that! It really is as simple as it sounds; take a box and place flowers inside to make a beautiful flower arrangement. Do they like fun shapes and sizes; such as colorful round and heart shaped boxes? Or do they like more of an understatedelegance like that of a square kraft box? You will also need to think about the type of flowers you will be using for the floral arrangement. This will help you determine what size box you will need. Once you have the perfect box ready to go, place a plastic container inside. If the plastic container moves a little too freely within the box, you can always help secure it with a few super tack glue dots. Depending on the type of flowers, you might need to place a piece of floral foam inside the plastic container to hold the stems in place. 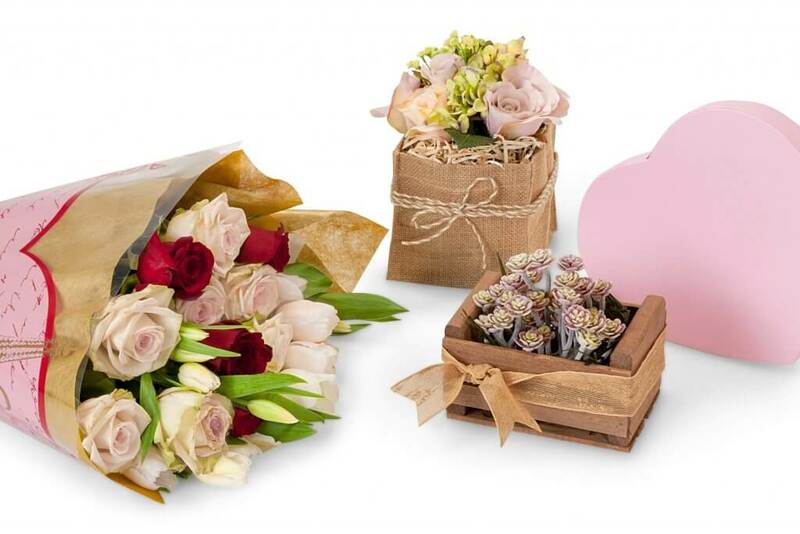 Now position your flowers within the box and start adding your personal touches to the floral gift presentation. Try a sheet of printed cello around the outside of the flowers to bring more elements of design into the bouquet and make it look more full, or wrap a double-faced satin ribbon around the box to give it a sophisticated yet charming feel. Be creative and have fun! This flower arrangement is a similar concept as that of the flowers in a box, but it is geared more toward someone who likes to keep flowers or plants for longer than a week and repurposed the container. Oh, and did I mention it is actually easier to put together than the first suggestion?!? Start by picking out a potted plant that you know your special person will adore. 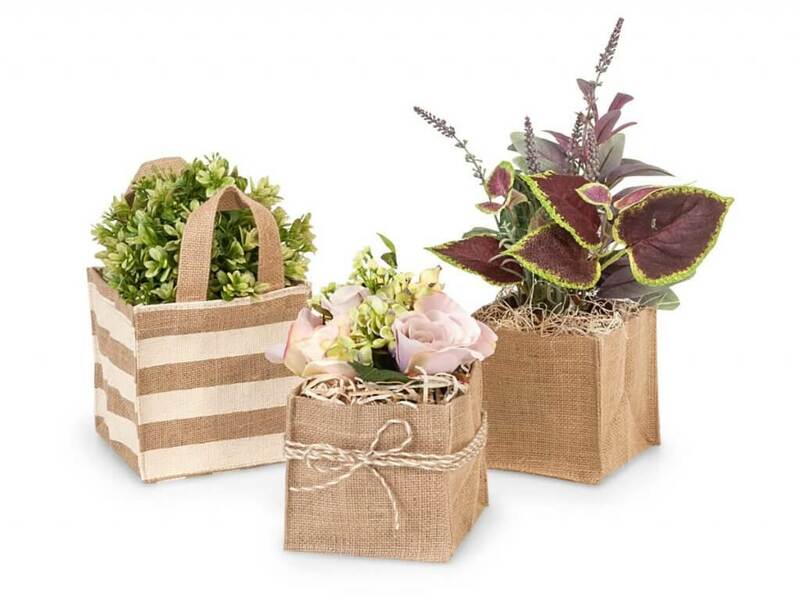 Then find a sturdy container; such as the natural burlap container with a clear plastic lining. These types of containers help to hold in moisture and can be easily wiped clean when it is time to use it for another project. Now you are ready to position basket filler between the pot and inside of the container. This will help keep everything in place while adding fun color and texture. Finally, add a ribbon that compliments the plant and container. If you are using a natural container, try wrapping jute twine around the outside several times and then tying a bow. Or, if you would like to add a touch of festiveness, try incorporating a Valentines ribbon. 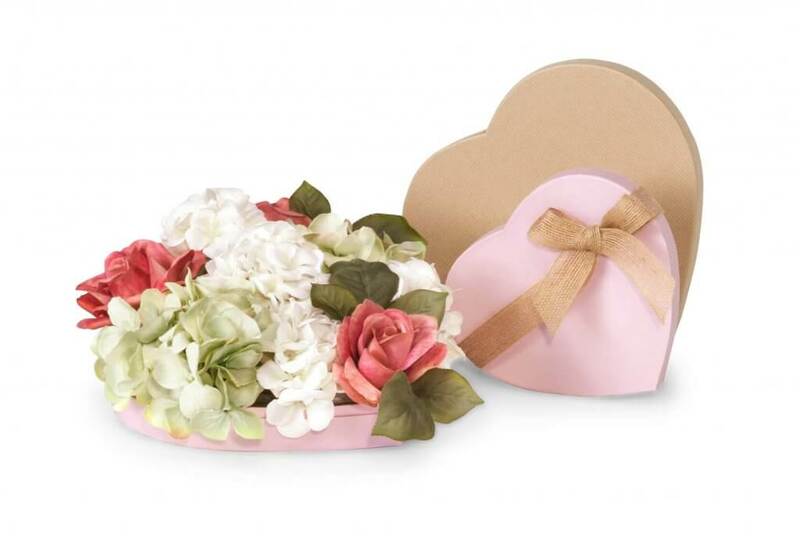 If your Valentine is more into rustic simplicity, then this floral gift set up is what you have been looking for! Take a wooden crate and place wood excelsior or natural fiber raffia on the bottom of the inside. I personally like the natural look, but colors are available if that is what you prefer. Now take small pots of different succulents and place them strategically inside the crate. Move the filler around so that the pots sit securely and at an appropriate height. 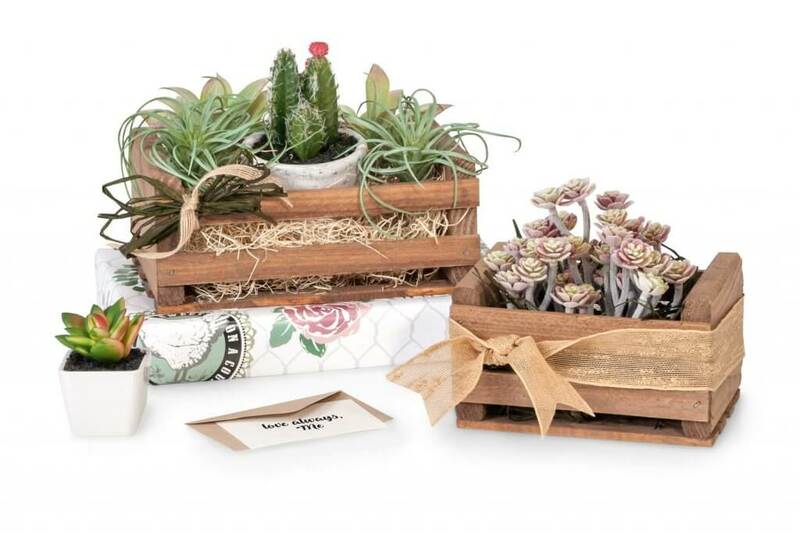 To finish off the look, you can add flowers around the succulents or take burlap ribbon and tie it to one side of the crate. Tuck a card, with a personalized note, inside of the crate between the wood edge and basket filler, so it just peeks out at you, and you are done! Huge gorgeous bouquets of fresh flowers are stunning! They can make even the toughest gift recipients stop in their tracks to admire their beauty over and over again, but sometimes getting that full bouquet look can be difficult. That is where decorative fabric flower wraps come in. Fabric flower wraps are available in several different colors and styles, so first pick out the design(s) that compliments your flower arrangement the best. 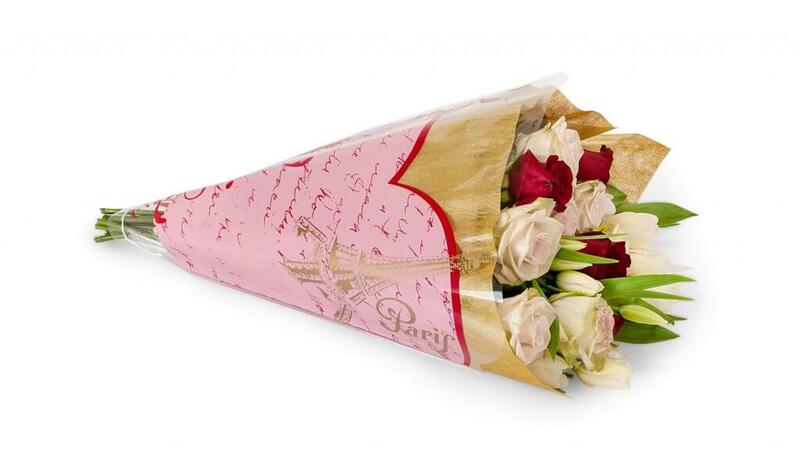 With flowers in hand and the floral wrap ready, you now get to decide how you would like to use the flower wrap. You can slide the stems of the flowers through the X cut to have them centered. Or you can fold it in half, offsetting the corners, and then wrap it around the fresh flower bouquet. Once you have the fabric wrapped around the flowers, secure it with a rubber band. 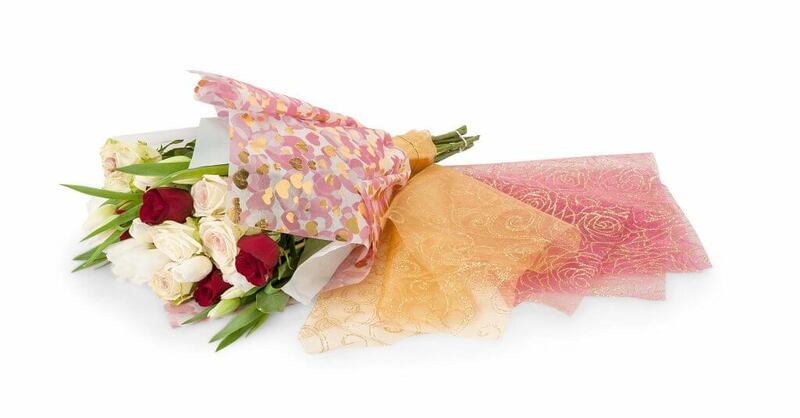 Work with the fabric wrap so it fills open areas in the bouquet and gives you the look you desire. To complete the presentation, choose a ribbon that enhances, but does not take away from, the beautiful fresh flower bouquet you have created. It never fails: all of a sudden time gets away from you, it is midafternoon on Valentine’s Day, and you are meeting your special someone, family, or friends in a couple of hours. You, my friend, are in desperate need of a quick grab and go gift, but, of course you don’t want it to look like you completely forgot. Luckily, I have saved the quickest and easiest floral gift solution for last. Take your floral arrangement, tie a rubber band around the stems (just below the leaves), and slide the bunch of flowers into a floral sleeve with a design; like the Love in Paris flower sleeve. You are now ready to go with a thoughtful gift in hand that does not look like you waited until the last minute. I would love to see what you create with one of the easy flower gift ideas. Please share your pictures in the comments below or tell us how you changed it up to make each gift even more personalized. Shop Nashville Wraps now for all your gift, gourmet, retail AND FLORAL packaging! Love the square potted plants idea!! WOW, what great ideas to make Valentine’s day extra special. Thanks Tawnya!